So many stews start by dredging meat with flour, but browning the meat on one side in a generous layer of olive oil also delivers a caramelized result (and is way less messy). Another deviation from the norm: While it’s more common to cook potatoes in the stew, roasting them in the oven gives the dish more texture. In a large Dutch oven or heavy 6-quart saucepan over medium heat, heat 1/4 cup of the olive oil. Season the meat with 2 teaspoons salt. Place the beef in the pan in one layer as much as possible and let brown, undisturbed, for 10 to 14 minutes (it’s okay if the tops still look raw). Meanwhile, chop the tomatoes, saving their juice. Slice 2 of the garlic cloves. Mince the remaining clove and set aside. Scatter the carrots, onion, and sliced garlic on top of the meat. Raise the heat to high, pour in the wine, and stir to dislodge the meat from the pan bottom. Cook until the wine has reduced by half, 2 to 3 minutes. Add the tomatoes and their juice, 1 rosemary sprig, the red pepper flakes, and 1/2 cup water. Lower the heat to low, partially cover, and cook, stirring occasionally, for 1-1/2 hours. Stir in the chard and simmer, uncovered, until the meat is mostly tender when pierced with a fork, about 30 minutes. Remove from the heat and let sit, covered, for 20 minutes to further tenderize. Meanwhile, preheat the oven to 400°F. Remove the leaves from the remaining rosemary sprig. Put the potatoes in a large baking dish with the remaining 2 tablespoons olive oil, 1/2 teaspoon salt, 1/4 teaspoon pepper, and the rosemary leaves and toss to coat. Roast the potatoes, gently turning with a spatula once or twice during cooking, until browned, 40 to 50 minutes. In a small bowl, mix together the minced garlic, parsley, and lemon zest. Remove and discard the rosemary sprig from the stew, and season the stew to taste with salt. 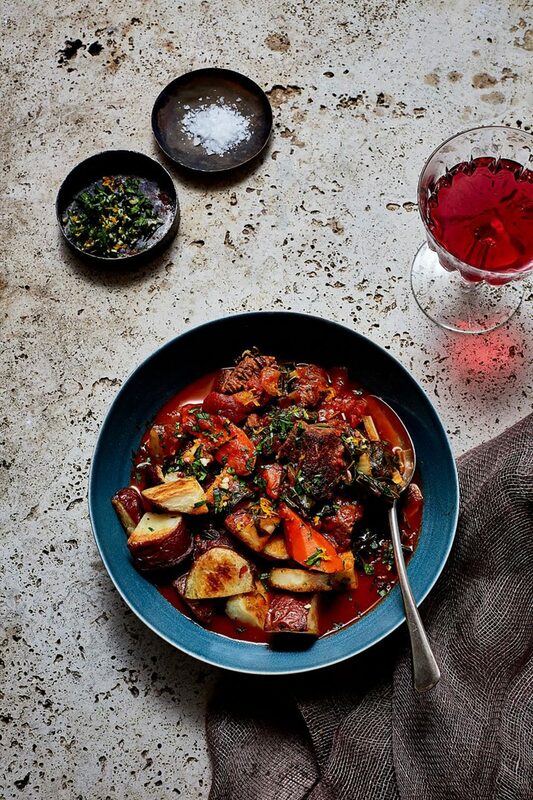 Divide the potatoes among bowls, top with a helping of stew, garnish with the parsley mixture, and serve.